MadCatz is widely known because of its outstanding gaming peripherals. This review is about one of the most distinctive and highly famous products of MadCatz, known as S.T.R.I.K.E. 7. Here is its full-fledged review containing detailed insight into its design, features, and performance. The S.T.R.I.K.E. 7 gaming keyboard is not designed like any other ordinary keyboard with a rectangular frame and a fragile palm rest. It is a modular, edgy-looking keyboard with a matte surface, sharp lines, and metal undercarriage. 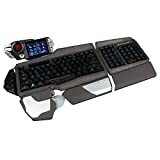 It comes with three swappable palm rests a removable starboard side for dividing its 10-key, navigation and arrow buttons, and a detachable four-toggle function strip. It also has a touchscreen hub which is called VENOM that hosts up to twenty-four programmable macros, a handful of productivity apps, and two USB ports. The palm rests can be snapped in with simple plastic tabs. Moreover, it has red and black mini USB cables, which excellently link different components to the VENOM console and connect it to the PC. Another great thing is that the black arrow and WASD keys can easily be swapped out for two different alternative sets. The S.T.R.I.K.E. 7 is the world’s most adjustable peripheral because of its five-part structure. It also features a TFT-LCD touchscreen, twelve built-in applications, full halo-effect RGB backlighting, and robust support for programmable macro keys. This keyboard is compatible to work excellently with Windows 7, 8, and 10. It has a very simple macro programming interface thanks to its intuitive graphical interface. You can assign single or multiple keystrokes to twenty-four separate macro keys and can conveniently fine-tune the settings, making it perfect for fast-paced games. Moreover, it supports a full-halo effect RGB backlighting, which comes with an astonishing sixteen million different colors, allowing you to customize your keyboard the way you want. Besides, its lacquered light guides and laser etched keys are best for playing games in the dark or dim light. The S.T.R.I.K.E. 7 works amazingly. It has a stronger, full-metal chassis when compared to other gaming keyboards, and its modular design lets you interlock only those components that are suitable for the gameplay. Its macro keys help make complex multi-key actions look easy, and you can quickly set multiple keystrokes to the macro keys which make the game easier and faster to play, allowing you to perform different tasks with just a single button. You can also publish custom profiles and share it with your gaming community and can save it for later usage. Powerful peripheral with good build quality. The S.T.R.I.K.E. 7 by MadCatz is a unique and impressive gaming keyboard which is filled with lots of incredible features. Some people might not like the fact that it uses membrane switches rather than mechanical, but let us assure you that its membrane switches are as responsive as the mechanical ones and don’t create obstacles while playing. Overall, it is a highly expensive keyboard, but its distinct design and numerous remarkable features justify its price.